This is the first in what promises to be a regular series of short blog posts about my badge collection. This isn’t quite as geeky as it sounds: it’s not a huge collection and I don’t actively collect them anymore, but recently I moved house and dug out of the loft a sizeable quantity of personal stuff I’d hoarded saved, some of it going back to my childhood in the 70s and 80s, and this box of badges was among the memorabilia. They were mostly given to me by benevolent grown-ups, or I got them for free when visiting some show or exhibition, or I bought them from the gift shop on a school trip. I think they might be fun to write about because they’re of a certain period. Even the sizes of them are interesting: most are larger than badges you’d see in gift shops now (probably as much to do with production costs as fashion), one or two are ridiculously huge (the 70s being a time when bigger was always better) and some are button badges of the 80s variety you bought to line your jacket lapel to let people know the bands you liked. A lot of them are rusty and although I’ve been desperate to show them to my own children, I instinctively warn them away from the sharp pins, notwithstanding the fact that it was perfectly normal to be trusted with sharp objects during my own childhood. But anyway. I’m aiming to pick a random badge from the box each day and post a bit about it, starting with the one above. The Fonz was everyone’s favourite character from the 70s US TV sitcom Happy Days which I watched religiously as a little kid (the only other show I remember being as devoted to in the 70s was Batman). The show revolved around the trivial shenanigans of a group of Milwaukee adolescents in the 50s and 60s. It was filmed before a live studio audience, and every time “Fonzie” walked on the audience cheered. He didn’t have to do anything to get this reception except simply show up. My recollection is that he was a minor character who stole the show in every episode; you had to sit through what seemed like hours of silliness just for five minutes of brilliance. 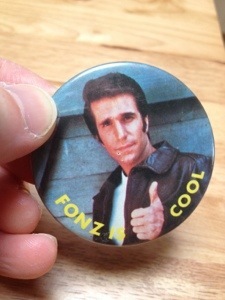 It seems to me that Fonzie has persisted into popular culture despite Happy Days being one of the few 70s cultural icons that haven’t been shamelessly revived and exploited, with Samuel L. Jackson famously referring to him in a particularly tense scene in Pulp Fiction. Of course as a grown-up you realise Fonzie was something of a pastiche and a caricature but at the time he did genuinely seem the epitome of cool, with his gestures (the swagger, the thumbs-up, combing his hair), his leather jacket, his minimalist vocabulary (“Hey”, “Cool it”, “Sit on it” – the latter I never fully understood), his confidence, and his good looks. I remember a defining episode in my own primary school life when the whole class was grounded because someone wrote something on the blackboard: I can’t remember exactly what it was – it wasn’t a swear, but enough to enrage the psychologically sadistic PE teacher, and when the room dissolved into chaos the idea struck me that I could dissolve the tension by yelling “Cool it!” It worked in that moment. But in general, as a nervous, utterly uncool child, Fonzie set me an example which I have never since managed to follow; in fact I blame him for setting the standard hopelessly high.